The Conversation – What Makes Haunted Houses Creepy and What Motivates Students? Yes, those are two very different questions in the title of this post. I put them together here because they are both thoughtful, scholarly yet accessible recent articles at the remarkable site The Conversation. McAndrew then describes the human “agent detection” mechanisms which provoke the creeping sense of anxiety and dread we feel when we are in haunted houses – real or made-up. We found that the students who were offered up to $100 for regular attendance were no more likely to attend sessions than if they were offered nothing at all. In other words, money made no difference. Alternatively, when students received a certificate of recognition for attending tutoring sessions regularly, the differences were dramatic. The students in the certificate group attended 42.5% more of their allotted tutoring hours than those assigned to the control group. Inspired by this wonderful song, I’m beginning a new feature – Everyday Miracles. When we become more mindful and not distracted, we begin to truly see the amazing aspects of this creation the Creator has made. This feature will reflect upon those “everyday miracles” which are around and within us. Even more remarkably, water is practically the only substance known to man that, as it cools from its liquid to solid state, actually expands. Virtually every other substance becomes denser as it “freezes,” but thanks to this remarkable property, ice cubes float in our drinks. More importantly for living organisms, lakes and other bodies of water freeze from the top down. How about that form of water which will likely fall from the sky in a month or so? The adage that no two snowflakes are alike seems hard to believe until you consider the fact that the patterns in which water molecules freeze vary depending on temperature and humidity. When you add the fact that the average snow crystal contains about 10 quintillion (10 followed by 18 zeroes) water molecules, it is easy to see why the number of possible combinations is unimaginably large. Wow! That’s a ridiculous amount of H20 molecules in a snowflake! So how much total water is there on earth? As a result, even though the Earth holds enough water to make a sphere about 860 miles in diameter, only a tiny percentage of this water is easily accessible to human beings, and increasing shortages loom in the future. Some scientists have predicted that, as some point in the 21st century, fresh water will become a more valuable commodity than petroleum. For me, another miraculous aspect of water on earth is that it is constantly recycled. Although the origin of water itself on earth is not fully understood, we know that water is not added to the earth’s water cycle we learned about in elementary school. This means that the H2O molecules in the water composing the cold glass of herbal ice tea on my desk to my left has been cycled through rivers, reservoirs, taps, clouds, droplets of vapor, and even other living creatures – for millions if not billions of years! The H2O I consume or inhale physically and intimately connects me to aspects of our planet, universe and countless living beings which existed long before me. And when I exhale, the H2O vapor in my breath, will be absorbed into the cycle elsewhere and recycled again and again long after I leave this part of creation. Is it any wonder that we use water in the foundational Christian Sacrament of Baptism? Much like the Holy Spirit which is in us and around us and connects, water does as much. A saying often misattributed to Albert Einstein claims there are two ways to lead a life. The first is as though nothing is a miracle, and the second is as though everything is a miracle. Water is entirely natural, hugely abundant and so necessary to life that our cells are bathed in it. Yet it is also so remarkable that, as a physician and scientist, I regard it as little short of miraculous. Last night I enjoyed a fantastic dinner with former colleagues from a major educational publisher with whom I worked a few years ago. The woman whom I sat next to had a similar career path as me – teaching few a few years, working as a consultant in educational publishing, and now returning to the classroom. For me it’s high school teaching. For her it’s third graders. The topic of standardized testing came up, specifically the PARCC (Partnership for Assessment of Readiness for College and Careers) Assessments which are linked to the controversial Common Core Standards which have their outspoken supporters and detractors. Learning as “right and wrong answers” is much like saying that the only value to playing a competitive basketball game is to win. Anyone who has coached youth knows that there are myriad benefits to competition in organized sports just as there are many benefits to learning besides getting “right and wrong answers. Also today, I saw this article in the Washington Post. 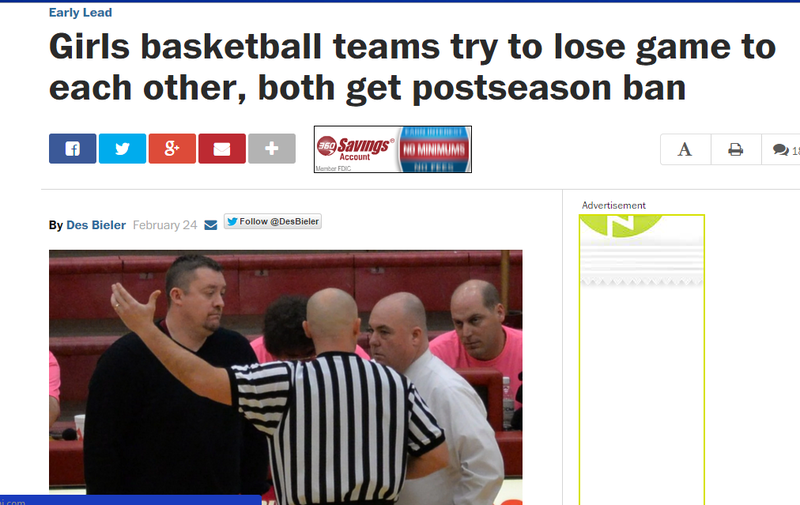 Apparently the players of this coach understood the message and took the court with the intention to lose. Once this team intentionally missed free throws, sought to turn the ball over, and allowed their opponent to score easily, it was clear they were seeking to lose. Then the other team adopted some of the same tactics and the refs stopped the game b/c it was obvious neither team was playing to win. To these teams and coaches the only value of the competition was the outcome, in this case losing and not winning. I wonder how many youth who take myriad standardized tests in their educational careers have come to view learning as simply about the score-based outcome. I wonder how many test-jaded students take the rebellious tactic, like my then seventh grade son did last year, of intentionally doing poorly on a standardized test. Most of all, I wonder if and when the pendulum will swing backwards from standardized testing to other, more holistic based assessments of student learning. One thing I do suspect in light of this spate of ridiculously record cold in Columbus (-11 F yesterday morning) is that God doesn’t like the PARCC test either as tests have been postponed or canceled both last week and this week due to so many school closings!